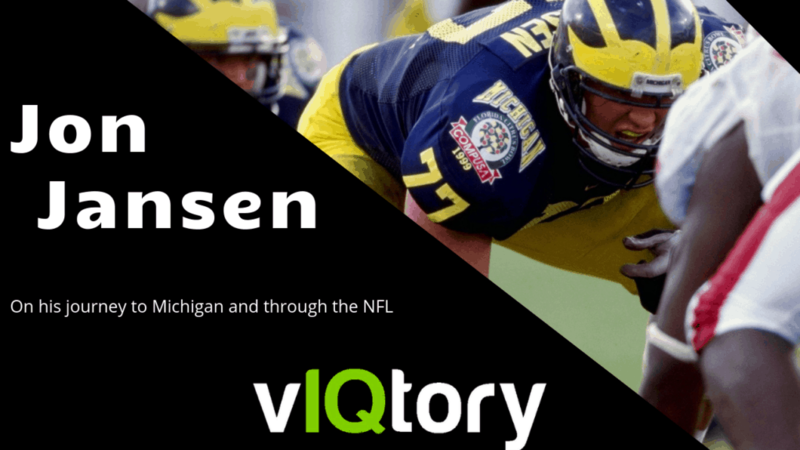 On this episode of the vIQtory podcast we are joined by 11 year NFL Veteran (10 of those years with the Redskins) at Offensive Tackle, Captain of the 1997 Michigan National Championship team and currently the host of the “In the Trenches” podcast – Jon Jansen. Jon joined us to talk, of course, little Michigan football but also to discuss multi-sport athletes, overcoming injuries and the story that is his journey as a pro athlete. Welcome to this episode of the victory podcast I am your host Steve McGrath alongside as always Mr. Chris Haddad. today we’re incredibly fortunate because we have another star-studded guest someone whose football resume is second to none mr. Jon Jansen. Jon was a three-sport athlete in high school from there went to university Michigan where 1997-1998 was a captain on both teams which means yes he did win a national title under coach Lokar was an all-american the following year in 98 from there gets drafted 37th overall in the 1999 draft to the Washington Redskins where he spent a decade has an 11 year career with that last year coming in Detroit. Looking in hindsight he’s named one of the 80 greatest Redskins of all time just last year in 2017 entered the state of Michigan Sports Hall of Fame. Jon now has his own podcast “in the trenches” where it’s focused on Michigan football and he does the pre and post game so Jon as if the resume didn’t speak for itself, I mean no one is doing as much as you are! Well I I love the game of football and I love the University of Michigan so it’s for me when I retired from football my kids were in an age where you know, if you’re a football coach you know when you don’t you just don’t get to be a dad as much as I wanted to be, and so radio and TV was kind of where I got to stay involved in football. I’ve been doing the Michigan games now going on five years I’m on staff here in the athletic department and, it’s you know, my podcasts were we’re in the in the infant stages we’ve come out with about that tomorrow or I’m sorry Wednesday will be the the third episode that we’ve had and it’s been it’s been a lot of fun because I get to talk football I get to talk Michigan football I get to be around the guys here in a team and it’s an exciting time for me. Jon I listen to the first podcast earlier today so for all of our listeners out there if you want insights from the players themselves the coaches themselves, this is what you need to go because it doesn’t get any better than first-hand information .That’s sort of you know the first question that I want to have for you is you know obviously you know you’re a huge part of the Michigan program now but let’s go back to when you’re 18 years old you know you are looking to do something for your college you know so how ultimately do you decide on Michigan what was that recruiting process like for you and how did you ultimately come to that decision? Um for me it was it was simple when I became a sophomore/ junior in high school and and I was recruited earlier for basketball because just kind of how the sport works, I thought really all I wanted to do was to be able to get a scholarship so I could pay for my education. Never had I mean everybody has dreams of being a pro football player a pro basketball player but for a while those are what they are they’re dreams. I wanted to make sure that I had an opportunity to go to school get an education and be able to provide for my family moving forward. When I was being recruited for football there was you know I had Wisconsin and Michigan State and Notre Dame and Michigan, I wanted to stay in the Midwest and there was no bigger team for me than Michigan. If I was going to go there all I needed was was coach Moeller, who was our coach at the time, to just say hey you know we’d love you to come to play at Michigan and you know we’re gonna offer you a scholarship! He did October 2 1993 and it is one of the will always be one of the greatest days of my life because so much of what I do now, obviously I’m still at Michigan and I’m still involved in football, but so much of who I am was was determined by that decision by going to Michigan. Also, getting a chance to play for Moe and Lloyd and Mike my position coach Terry Malone Bobby Morris. I was amongst great men and I knew my parents were excited about it because you know you raise a kid from the moment they’re born until they’re 18 and and they you know they go off to college. And you’ll always be mom and dad to these kids but now you send them off to you know to college and they’re gonna be influenced by a lot of things. My parents have said it many times over the years we’re soul we were so glad and happy to send you to a group of men like they had at Michigan because we were comfortable that they were gonna you know finish the work that we had started. well you know we we had spent at Michigan a couple of years my first few years we were eight and four eight and four and when you go to a school like Michigan they’re in you and you get to be as junior senior you start thinking about what’s your legacy gonna be when you leave. We didn’t want it to be of a bunch of eight and four seasons we’re yeah okay we started out five and oh and and you know we always falter towards the end of the year. We had taken some lessons that we had learned over those the losses that we have had and talked about it. We would spend time in the offseason in this in winter and summer conditioning you know talking about why we lost those games. It wasn’t because it was never because we got beat by another team it was because we had either lost focus or we didn’t show up prepared. It was something that we did and we said in 97 we want to make sure that we show up for every game and and we give ourselves the best chance to win and it was it’s a sacrifice. I talked to these guys about it all the time there are certain sacrifices that you have to make to achieve certain goals. After a game you know after a big win yeah the thought is let’s go out and celebrate well you know what when you celebrate and you know if you’re 21 and you go out and have a couple of beers that affects how you train the next day.We said we were going to make the sacrifice, you know we were going to go out and celebrate but we weren’t going to overindulge, we weren’t going to indulge at all, because that was a sacrifice that we made for five months. But for the rest of our lives we get to talk about what it meant to win a national championship there’s only been one national championship at Michigan in the last seventy years, and that’s ours. That’s a memory and that’s something that the fans don’t ever forget it’s something that that we as a team have never forgot and and I think it’s that it’s that group sacrifice that that also you know brought us that much closer together. Well the the hardest thing about being hurt as a player and I had never been hurt up to that point – I mean you may break a finger or break a hand, but they’re all things that you can play through. You tear an Achilles and your seasons done there’s no hole that you’re gonna play that year. So for me it was you know when you’re in recovery you’re not around the guys as much as you would be you know. When guys are in meetings or they’re out on the field you know let’s face it you know we’re all athletes we’d love to have a good time funny stuff happens and you’re not in you know the inside jokes and those guys come in from from the practice field and they’re talking about something, you just always feel like an outsider no matter how much you’re around, you’re not in that group anymore. I think that’s probably the hardest thing to deal with because it’s just something that you never you’ve never been used to the the the recovery of the injury you know, and spending time in the training room in the weight room and making sure you give yourself a chance to get back to playing on the field. Honestly that was the easy part because you know when I was a professional athlete that was paid to do it but you have this drive that says I’m this is not how I’m gonna go out I want to go out you know on my terms. There are so few people that have that opportunity to go out on their terms and you know and I didn’t, you know, at the end of my career, I didn’t go out on my terms because you get released and and nobody signs you you still want to play. But you know I had I had a great run and from from that moment on I really got a chance to appreciate even more the privilege that I had playing at Michigan. I’ve also got the opportunity to play in the NFL and play football for as long as I did. Some of these guys now think that it’s their right and they deserve that. It’s not it’s a privilege and you got to take advantage of every every moment that you have on the field, because it’s some day you know you’re gonna want to play and and nobody’s gonna nobody’s going to ask you. Yeah I can imagine but you know a couple of things you just said there about appreciating the opportunity and there’s injuries that you can play through. Well you rebound from the Achilles to have your only all-pro season in the NFL the following year so you didn’t just come back to the level you were at before, you would now hit a new high and for those of you that that don’t understand, Jon’s nickname is Rock. He’s the epitome of toughness. You went to that o5 campaign with two broken thumbs you weren’t all-pro with two casts on your hands, so no one can say anything about playing through injuries like you can. I mean the fact that you came back to the level that you did, you know is more than a testament of what it sort of takes to get back on top battling back from an injury while not being able to play through them. yeah it was – that was a tough year and when you have injuries, that are just that they’re just injuries – you’re not hurt. You’re not gonna be out there’s there’s a certain part in your in your mind that you’ve got to go to and say you know what, even though this hurts I could still help my team win. Also the the benefit of having my hands casted was I knew I was never gonna be called for holding! It was they basically gave me two weapons, I got a chance numb up my hands they put casts on them and I did they just gave me two to clubs to use. so Jon you mentioned earlier Russ Grimm – I want to talk a little bit about the Hogs and what has started in the late 70s & 80s with the linemen Russ Grimm, Mark Schlereth, etc. Coming into the Redskins, was that the hog mindset still around when you got there as far as that tough, gritty you know – put you on your back mindset of the linemen that the Hogs had with the Redskins? I mean essentially look back 30 40 years ago guys are getting much bigger. Look back in the 1940s, 1950s linemen weren’t as big as they are now today. What do you think that has t do with? Is it just the natural evolution of the position growing or is it more of the way kids of training nowadays? Well I think it’s it everything starts with money. You look back to when when Russ and those guys were playing that was their second job.They didn’t get paid enough to live year round just by playing football. Early on in their career so they had jobs in the offseason. Now all of a sudden when when the salaries get to a point where okay yeah this is a professional athlete that’s all he does now, in the offseason you start training instead of going to a different job. You start watching what you eat a little bit more, finding out what nutrition wise, how your body recovers. You get a chance to recover and I think there’s so much science behind how kids train in high school, how they train in college, how they eat and at those different levels. Also how their bodies are developing, and it’s just a natural evolution. I wouldn’t say the position has changed but due to technology and science I think that’s why they’re getting bigger. Especially a big part is that you can measure essentially everything that goes into your body. It’s pretty remarkable and pretty incredible. I want to talk a little about the o-line. You played Chris Samuels and guys that made you essentially a dominant offensive line, what do you think it was, in your mind as an offensive line, that that makes a good offensive line? Is it just hanging out together, working in the offseason going over schemes, getting your steps down together? Is there one one thing in particular that makes a good offensive line really shine the NFL? So Jon as we get towards the last stage of your NFL career, you have the ability to come back home and play for the Detroit Lions. What did it mean to you to be able to play professionally at the end of your career, back home. I know the answer to this but I’ll ask anyway spread off into our power run offense? I heard that you’re a little bit of a country music fan so right now give me your top one to handful of artists that yeah you really like? and last but not least what’s most important the players of the scheme?